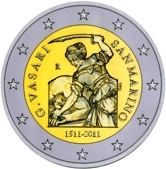 Details relating to the San Marino Commemorative of 2011. This coin commemorates the 500th anniversary of the birth of the Italian Painter, Architect and Historian Giorgio Vasari. The somewhat gruesome motif is a part of his painting “Judith decapitates Holofernes”. This is from the book Judith in the old testament. Now here is something interesting and previously unknown to me – there are three versions of the old testament Hebrew (Jewish), Protestant and Roman Catholic and the book Judith is only in the Catholic version – one learns a lot through coins!! Follow the links if you wish to become wiser!! In bold script from eight to ten o’clock is the inscription “G. VASARI”. Also in bold script from one to four o’clock is the name of the issuing country. At the bottom, under the main motif are the year of birth of Vasari and the year of issue of the coin – 1511 2011. Return from San Marino Commemorative 2011 to euro coin collector.